, and do not over discharge the battery otherwise it may fail and become unrecoverable. We do not recommend them for use in Kontiki’s or for spotlighting as this almost inevitably leads to over-discharge and battery failure. Racing applications are not covered by Shorai at all. Misuse. 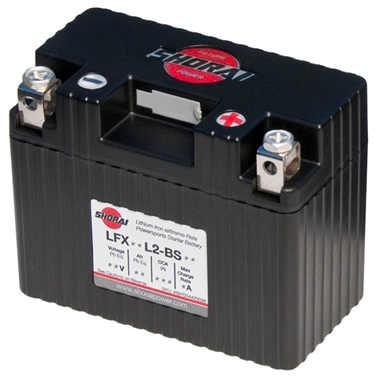 Batteries must be used for the intended application and maintained accordingly. One issue has been that they are used for repeated cranking until they are flat, such as when tuning or setting up an engine. 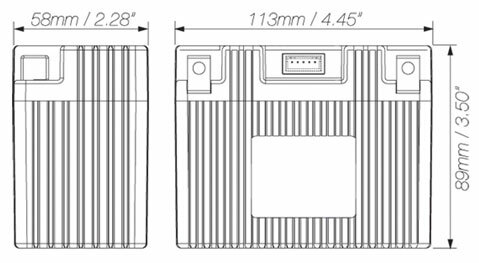 While Shorai batteries maintain their maximum CCA without dying away, they still have a limit and if tuning an engine, either recharge them at 12.8v or use a jumper pack. Accidental damage. Sorry, but we will not replace a battery that has been damaged in an accident. Dropping them or crashing them is not a warranty issue. Whilst they are tough cases and have survived some amazing crashes, they are able to be damaged by this. They cannot be damaged by “only a minor knock, honest!” It takes some force to damage a case! Max Charge Rate: 9 Amps.